Each week, we look at industry news curated by MediaScope. This week we look at the future of invisible online advertising, and the 30 elements of consumer value. When customers evaluate a product or service, they weigh its perceived value against the asking price. Marketers have generally focused much of their time and energy on managing the price side of that equation, since raising prices can immediately boost profits. But that’s the easy part: pricing usually consists of managing a relatively small set of numbers, and pricing analytics and tactics are highly evolved. 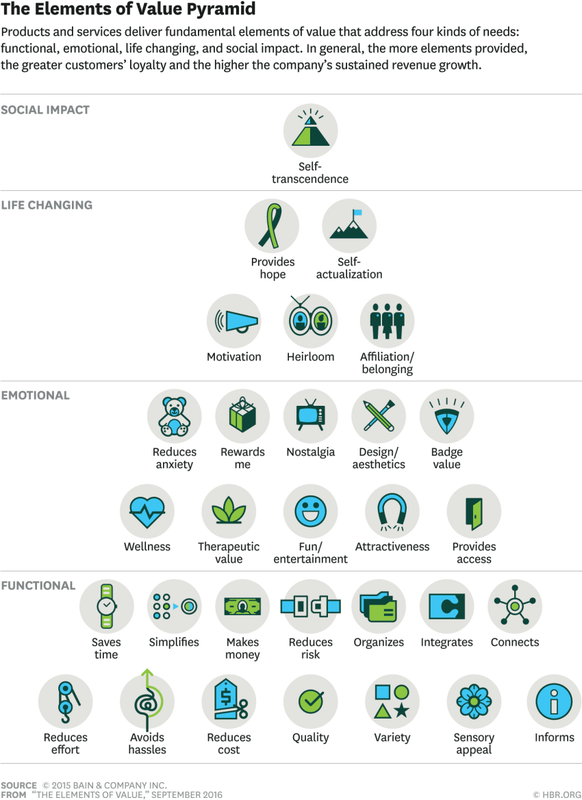 What consumers truly value, however, can be difficult to pin down and psychologically complicated. As long as digital publishing flattens the business value of content, there is little hope to improve the economics of news publishing. The problem needs to be addressed. The biggest failure of digital news platforms is their inability to assign a different economic value depending on a story’s type and quality. On a news site or an app, advertising space is sold for the same price whether it’s a news wrap-up quickly put together by a junior editor or a 10,000 words piece that required a whole team of writers, editors and fact-checkers. The only element impacting the CPM (cost per thousand impressions) is the ad module placement. An ad located on the home page of a section will be many times more expensive than one buried elsewhere on the site; similarly, being at the top of the screen pays way better than being at the bottom. But the economic yield has nothing to do with the size, depth, uniqueness of a piece, or its authorship. People are looking for ways to reduce the daily noise, to filter and block anything intrusive, unwelcome, and irrelevant – including advertising. In the US, Americans are bombarded with an estimated 4,000 to 10,000 ads a day. In a desperate attempt to cut through all the noise, advertisers have conjured up every imaginable way – pop-ups, take-overs, non-skippables – to stop you in your tracks, whether you like it or not. Which is why it should be no surprise that ad blocking is growing by an estimated 41% year-on-year. At last count over 400 million people have downloaded some form of ad blocking technology and millions more will do the same in the near future. Why? Most people cite major load times and costly data usage. It’s becoming abundantly clear to everyone connected to the US television economy that the once near-universal reach of the cable television bundle is in decline. What’s more, the reach that remains is under-growing competition and increasing value scrutiny. The casual conclusion reached most often is simple. If you give people the opportunity to customise, and to get just what they believe to represent a fair value exchange, that’s exactly what they will do. There is more texture to this discussion, much of which surrounds the pricing intersection of the prix fixe and à la carte models. The rise of sponsored content has been in the news a lot lately, with big brands like Unilever and Goldman Sachs announcing the creation of their own in-house content studios. Marketers understand that the way people interact with advertising has changed, especially in a world where the use of ad-blocking technology continues to rise, and that consumers are more apt to proactively seek out interesting content than to click on irrelevant advertising.